The Eliot Building, also known as the Franz Hardware Building for its long-time tenant, was designed for Dr T. L. Eliot by renowned Portland architect A. E. Doyle. As you can see by his notes, he was located in Florence Italy when he took this commission. The design must have been modified before construction as we see it was built with four windows on the upper level instead of three, and a central highlight was added to make a more pronounced division between two halves of the building. We are lucky to have several pencil sketches which indicate Doyle considered an arched fifth central window with a wrought iron balcony before settling on the current design. 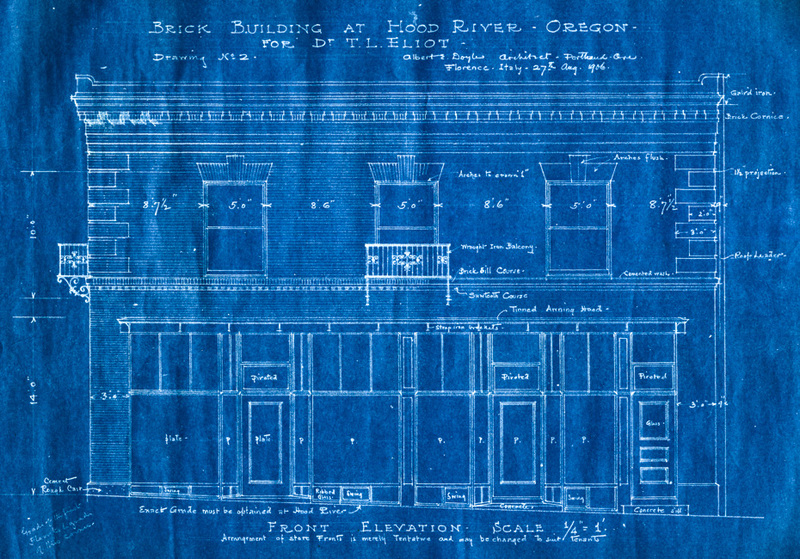 Doyle would later design another building in Hood River, the Butler Bank Building at Third and Oak. Did Eliot have a planned purpose for this building? L.E., don't know if there was a tenant in mind for this building but 1906 was the heart of the downtown construction boom. Brick buildings were being built up and down Oak Street. In just over a decade almost all the buildings on Oak were constructed, so there must have been a demand for commercial space. was A.E Doyle a prominent figure here in Hood River??? Does anyone know who designed the building to the east of the Franz Building. At one time that store was Franz Furniture and there was a large open archway between the stores. I always remember the archway being closed off but when Franz Hardware had a fire the archway was opened up and some merchandise was moved into the furniture side to accommodate customers. Since both businesses had the name Franz I wonder if there was a family dispute that caused the archway to be closed off. An interesting fact was that while George Jubitz had an interest in the hardware building his wife, Betty, had an interest in the furniture building. Mauro, A.E. Doyle was a very prominent architect in Portland. We're lucky for a small town to have two of his buildings. T.L. Eliot, though he was a minister in Portland, spent quite a bit of time in Hood River at his vacation home, Shushula, in the Heights. Reading the "Building at the End of the Oregon Trail" meeting of the Vernacular Architecture Forum... it says that in 1909 Eliot constructed the building for the Franz Hardware business. So, that must have been his original intention. It also says that the building was designed by P. M. Hall-Lewis in 1906. "The building was constructed three years after its initial design, under additional direction from A.E. Doyle. The facade is made from locally made bluff colored brick." "The C.H. Sprout Building was constructed in 1911 for E.A. Franz's furniture store, located at 112 Oak. Franz, who was ex- panding his business ventures, connected the building with his adjacent hardware store in the Eliot Building through an arch- way cut into the adjoining wall. The building was designed by W.R. McLain, an associate of Franz, who became the manager ofthe furniture store." Paul Minton Hall-Lewis also designed the Paris Fair/IOOF building, the Davis building and the HR High School. That's me in the green cat at he stop sign. What a surprise! Libby, you are now Historic.